Joey Maxim, blue sharpie, $20. Dwight Muhammad Qawi, blue sharpie, $15. Earnie Shavers, blue sharpie, printed, $20. Mike Weaver, blue sharpie, S/O. Ken Norton, black sharpie, S/O. 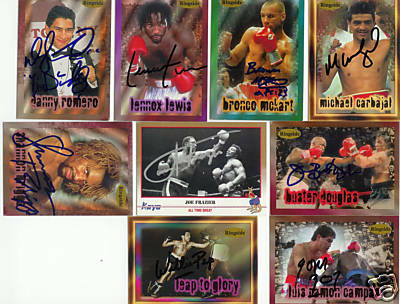 Ken Norton, gold sharpie on card #51 (group shot), $20. Gene Fullmer, black sharpie, $15. Emile Griffith, blue sharpie, $15. Archie Moore, blue sharpie, $35. Carlos Ortiz, blue sharpie, $20. 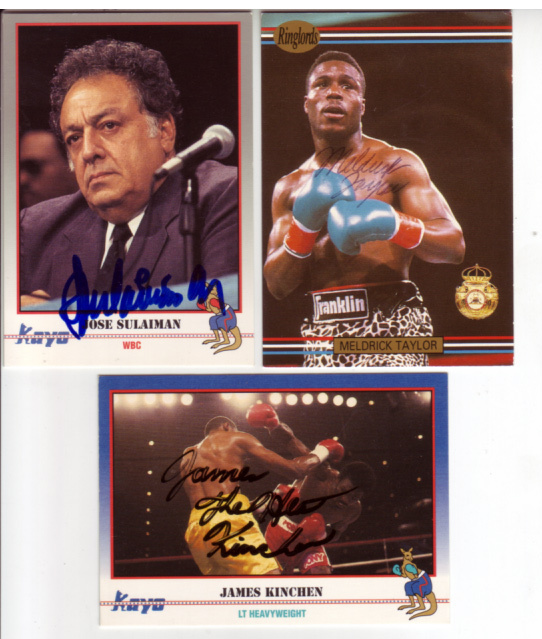 Jake LaMotta, blue sharpie on card #144 vs. Robinson, $25. Meldrick Taylor, blue sharpie, $15. Iran Barkley, blue sharpie, $15. 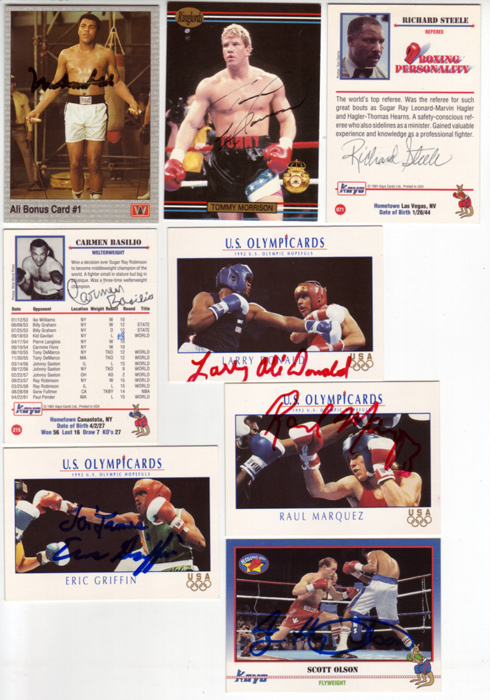 Ray Mancini, black sharpie, $20. George Foreman, blue sharpie, (difficult to read), $35. Kevin Pompey, blue sharpie, S/O. Joey Giardello. black sharpie, $15. Michael Carbajal, black sharpie, $15. Sean O'Grady, black ballpoint, (poor, pen skipped), S/O. Joe Frazier, blue sharpie, $35. 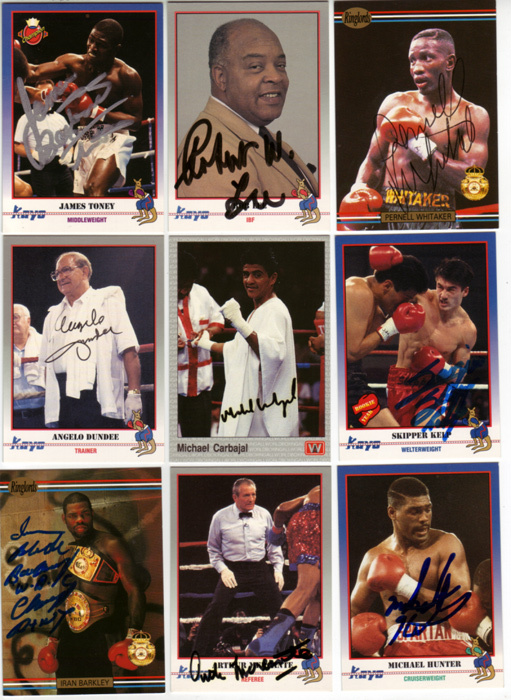 George Foreman, black sharpie (on #211 vs. Holyfield), $35. Bob Foster, black ballpoint, $12. Carlos Palomino, gold sharpie, (Anaheim National), $35. Tommy Morrison, gold sharpie, (Anaheim National), $35. James Toney, gold sharpie, (Anaheim National), $35. Michael Hunter, blue sharpie, S/O. Tim Witherspoon, blue sharpie, S/O. Carl Williams, blue sharpie, $15. Ray Mercer, blue sharpie, $15. Virgil Hill, blue sharpie, S/O. 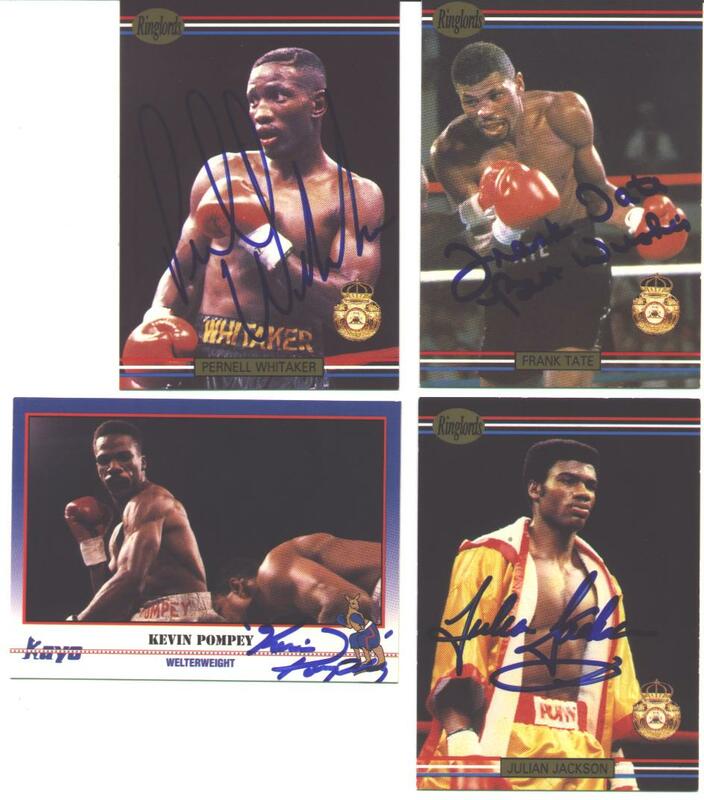 Thomas Hearns, gold sharpie, S/O. Michael Nunn, blue sharpie, $15. Meldrick Taylor, blue sharpie, $12. Loreto Garza, blue sharpie, $10. Hector Camacho, blue sharpie, $20. Tracy Spann, blue sharpie, $10. Carmen Basilio, blue felt tip, $15. Frank Bruno, black sharpie, $25. Michael Carbajal, black sharpie, S/O. 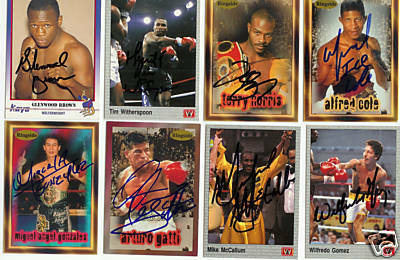 Arturo Gatti, blue sharpie, S/O. 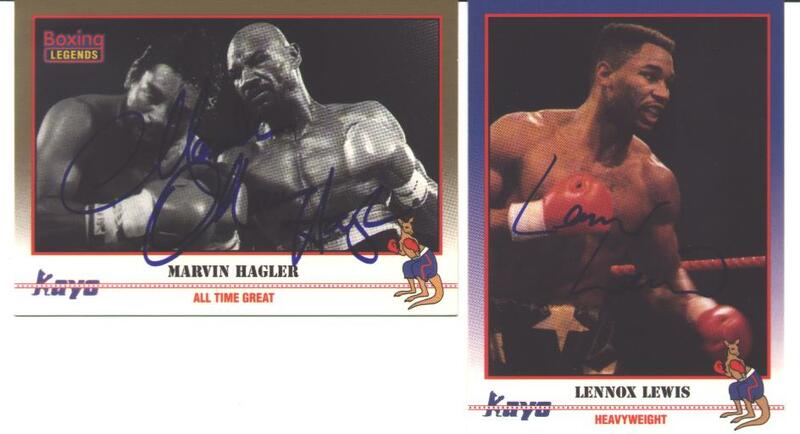 Lennox Lewis, black sharpie, S/O. Willie Pep, black sharpie, S/O. Ray Anis, black felt tip, $10. Larry Donald, gold sharpie, $10. Joe Gatti, blue ballpoint, S/O. Buster Mathis, Jr., blue sharpie, $12. Alex Stewart, blue sharpie, $12. Floyd Patterson, Victoria Gallery, blue sharpie, S/O. Jake LaMotta, Victoria Gallery, blue sharpie, $25. Gil Turner, Exhibit, blue ballpoint, S/O. Paddy DeMarco, Exhibit, blue ballpoint, S/O. Matthew Saad Muhammad, black sharpie, art postcard, $15.